> Marlboro Street in the Back Bay. Gorgeous! A classic view of the Back Bay in May. Nice to see a photo from you here. Ah...you remembered that I especially love this view on Marlborough Street. Just coincidentally, my subdivision here in Charleston is named Marlborough. I think Kevin Shea did a painting of this very same spot. 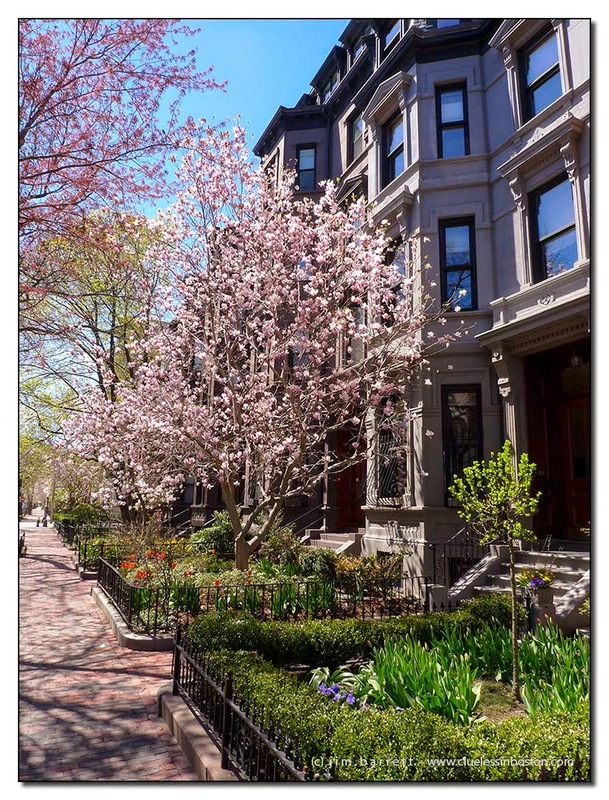 The perfect spring photo from Boston for me! Merci. Glorious sight Jim, the blossoms are a treat for sore eyes :) Couldn't be more different from your last post! Such a contrast to the black and white snow scene! I hear the weather is quite perfect in Bean town right now. The nice spring maybe makes up for the cruel winter, eh? This gorgeous spring photo with all its color and freshness is the reward for surviving the winter! You must be so glad to see spring! Gorgeous photo. Finally! You had such a bad winter. I like this photo - I love the greenery and pink blossoms against the backdrop of the old houses.